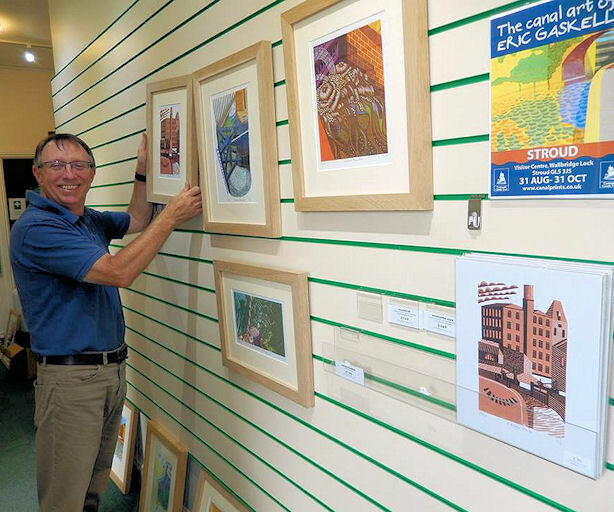 Eric Gaskell was in Stroud on 29th August to hang his latest exhibition of canal themed lino cut pictures. The exhibition consists of fifteen framed limited edition prints, a number of unframed prints featuring Eric’s unique representation of Stroud’s Ebley Mill and a collection of coloured postcards. The exhibition will run from 31st August to 31st October. Eric's previous Wallbridge Lock Exhibition proved very popular. So, if you are minded to purchase an early Christmas present we advise that you get along the the Visitor Centre and, at least, get your deposit recorded against your chosen title. Eric Gaskell was born in Wigan, England in 1957 and studied painting and printmaking at Wigan College and Sunderland University. He left art college in 1980 winning two painting scholarships, one to New York and one to Istanbul, as well as the Sunderland Echo Fine Art prize. Eric is a member of the Society of Graphic Fine Art. Eric’s distinctive style is featured in the opening sequence of the BBC six part series Canals — The Making of a Nation.